With the arrival of December and its colder temperatures here in the Midwestern United States, my thoughts often turn to warmer climates. 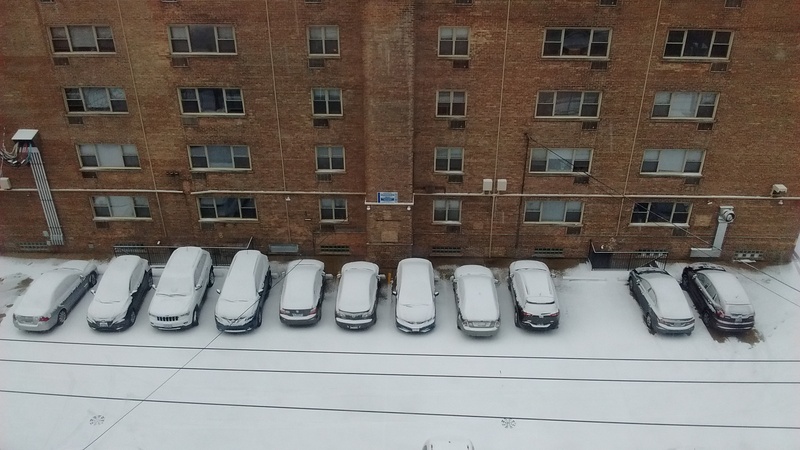 I lived in Florida for a number of years, and while I absolutely loved my time in the Tampa Bay area, I still have no regrets about moving to Chicago… that is, until it’s ten degrees Fahrenheit and the snow blowing in my face is stinging my skin. Ob-La-Di… It’s a small price to pay for the otherwise year-round awesomeness the Windy City has to offer. I spotted this second-year Ford Thunderbird in the historic South Beach district of Miami while on vacation a number of years back. It’s very easy for a guy like me with a taste for classic things to get lost in the vintage Art Deco architecture and exuberant signage in this area. When I saw this T-Bird parked close to the entrance of the outdoor patio of The Clevelander, it was a moment for me accurately represented by the selective B&W treatment of the title photo. For just a few moments, this car, and the buildings behind it, were all I could focus on. “Earth to Joe…” Those closest to me are great at acting as a tether while I get lost in my Walter Mitty-esque daydreams with my ever-present Canon camera. Sometimes, that’s a good thing. Perhaps just as often, I find it annoying. As my friend Shaunna has told me before, “You gotta do you, Boo.” Shaunna speaks the truth, and her succinctly stated philosophy is one I can get behind. Absent the gift of my vivid imagination, my experience of much of today’s world would seem a lot less fun. Both pragmatism and whimsy play important roles in my life. As far as this particular Thunderbird, it was a stunner, especially in this shade of turquoise. I’m not necessarily a fan of the Continental spare tire look, but in its application here on this beauty (in its first and only stock appearance on the Thunderbird, for ’56), I genuinely like it. In terms of looks, between this car and its Chevrolet Corvette competitor from the same year, it’s kind of a push for me. I’d probably give the Thunderbird the nod simply because unlike the Corvette, which looks almost exclusively curvilinear and a bit droopy in the rear, the T-Bird mixes it up with the inclusion of a good balance of curves and straight lines, in addition to neat design flourishes, like the small fins over the taillamps and the “gills” on the front fenders. 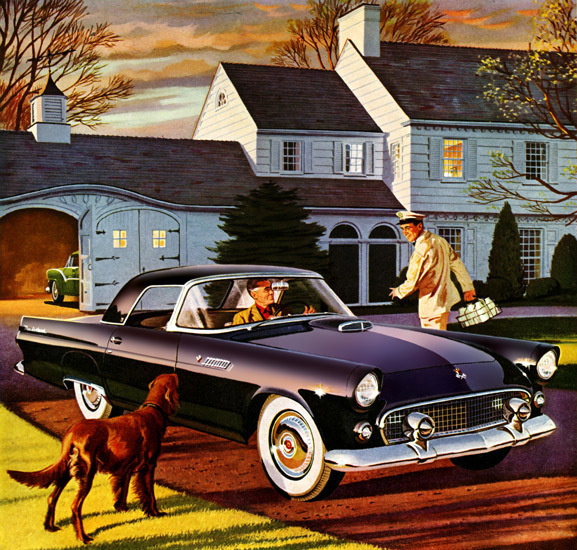 Unlike the Corvette in its first appearance for 1953, the Thunderbird arrived in ’55 with V8 power. And its target demographic was distinctly different from the Corvette, which positioned itself as a genuine sports car. 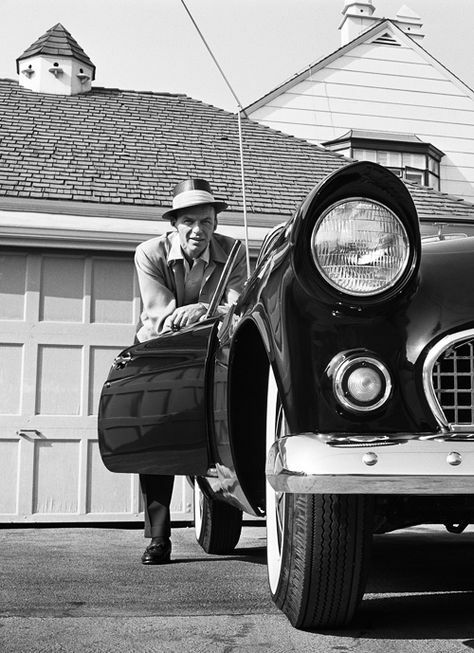 Not so the Thunderbird, which Ford called a “personal car”. It was for the guy who liked the idea of sports cars, but not the spartan reality. For ’56, the T-Bird’s standard 292-cubic inch V8 was rated at 202 hp, with its newly-optional 312 V8 producing an additional 13 hp when teamed with the manual overdrive transmission, or 23 more hp with the Ford-O-Matic. By ’56, the Corvette came standard with a 265-cubic inch V8 that produced either 210 hp, or 225 hp with two-four barrel carburation. And it was starting to make itself felt on the race tracks. The Ford weighed about 10% more than the Chevy (3,000 lbs. versus 2,750), with the latter’s fiberglass bodywork likely owing to much of the difference. The Thunderbird outsold the Corvette by a ratio of more than four-to-one that year, with about 15,600 units moved compared with the Corvette’s 3,500. The base prices of the two cars started within $2 of each other. Facts, schmacts. My present-day experience of this type of vintage halo car is more about image, feel and emotion rather than numbers or actual dynamics, scoring many more points with my right brain than with my left. A mental, musical soundtrack often accompanies my automotive fantasies. I’ve recently rediscovered my love of downtempo electronica from the past twenty years, or so. I’ll wrap this post with a track that seems to embody the moment of casual, old-meets-new elegance our featured car helped facilitate in my mind: “Ocean Beach (Cybophonia Cinematic Remix)”, by The Black Mighty Orchestra. Sometimes, a little mental escapism can prove to be a welcome thing when the weather turns cold. Without imagination, the modern world is as flat as it is harsh. Our present wonders of the chip and the net are not visible, and the astonishing results from the revolution they are causing are quickly absorbed as ordinary. There is no brick and mortar legacy, no chrome and certainly no turquoise. Absent the gift of your imagination, Joseph Dennis, we wouldn’t have the benefit of your reveries and images on this site. Which would be a loss to our imaginings. JustyBaum, thank you so much. I appreciate that you appreciate my untetheredness. :). Much of what many of us appreciate about cars is not something we can quantify or qualify. Never been a fan of continental kits. I’ll make an exception for this car, though! The ’56 Thunderbird is one of the few cars that actually looks good with one… and what a lovely little turquoise daydream it is! Speaking of combining practicality and whimsy, part of the reason I like the continental kit on this old T-Bird is the fact that it actually does hold a real, genuine spare tire. It’s amazing how good a continental kit can look when it’s actually designed for the car, not tacked on later. As a person who normally puts continental kits ‘up’ (actually down) there with broughams with vinyl roofs, the 56 Thunderbird is the one and only version I’ve ever seen that I liked. Which still puts it one application over broughams in my book. 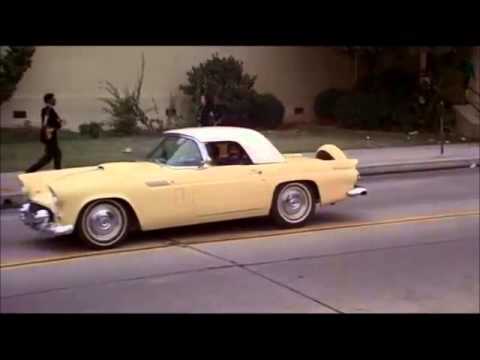 The continental kit does look good on the T-bird; however, it was said to have a detrimental effect on the handling with the extra weight slung out back. The original Thunderbird will forever be one of my favorite classic cars! Incredible pictures too! You do it its deserved justice. 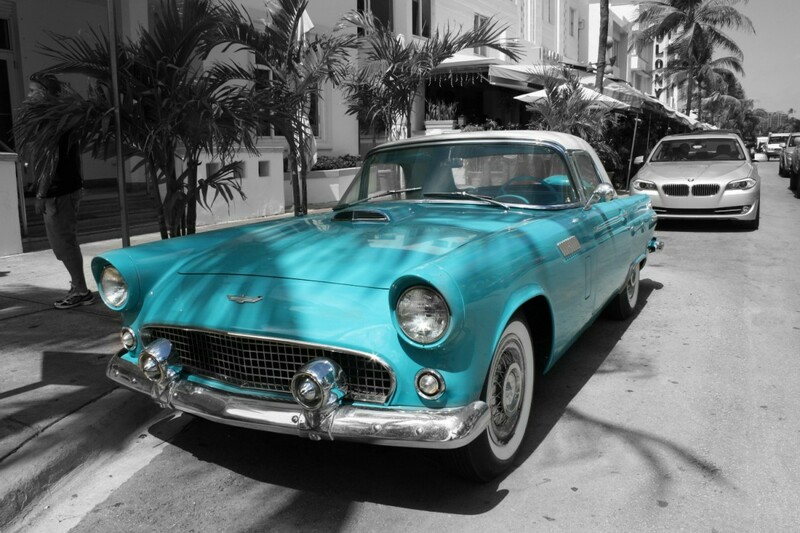 A perfect setting for a ’56 Thunderbird, and the perfect time of year to be looking at artistic pictures of Miami. And extra credit for getting the 2002-05 T-bird sneaking into the background of your picture of the 56’s continental kit! I thought that roofline back there looked familiar! Haha! I’m so glad someone else noticed that photobomb. Great photo and text. As I was born 10 years after the T-bird, and outrageous taxes kept sports, sporty, and personal cars away from these shores, the trickling few usually were kept in some sea resort. So, I did never see one “alive”, i.e., being actually used as a daily driver. Many decades later, some of them were imported, already as classics, and were underwhelming for me. Too low, cramped…the opposite to what an American car should be in this neighborhood (I stand corrected…Avis or Hertz brought in a fleet of Mustang 302s in 1970, which I don’t rememeber either). When my cousin got a 1948 Morgan, for me it was just a nice machine to watch, but dreadful to ride on. Long live the ´66 Impala sports sedan….! Pure automotive jewelery. Not practicle but darn nice to be seen in. There isn’t a bad line on these cars. I still can’t believe that with this for a blueprint, Ford goofed the retro 2 seat T bird and made it look like a guppy. 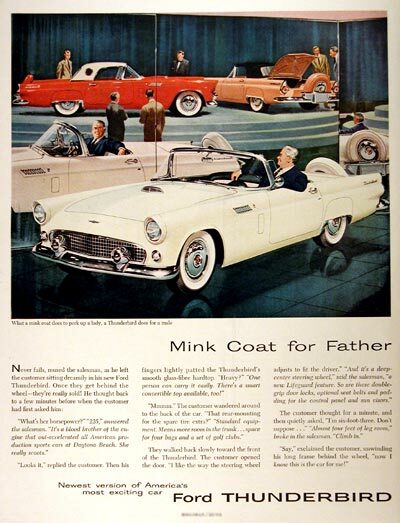 Interesting little tidbit: the 1955 T-bird was originally supposed to have Fairlane-like bright side trim – it got as far as early promotion materials. It appears that the designers revolted at the last minute and won the day. Thank goodness. I actually don’t hate this. But I agree with you – the production Thunderbird looks *much* better. A perfect trifecta of car, place and mood. You strike a chord with me, as I spend way too much time “out there” with nothing or nobody to occupy me besides the thoughts swirling around loose in my head. There are some cars that seem to become more than what they are, and the original 2 seat Thunderbird was one of them. This car transcends the “Ford v. Chevy” or the “sports car v. cruiser” squabbles. Everyone loves the early Thunderbird. Ford styling in the mid 50s had just as much going on as Ford styling did in the 30s – cars on which it is hard to find a single detail that could have been done better. I can only remember seeing one of these in somewhat normal use, it was a dull, faded pink 55 or 56 that had more than a little rust in the quarters and rockers. Even in that worn down condition there was something special about it. I would be hard pressed to pick a color better than this turquoise, too. Yes! I love the Rat Pack. I had recently seen an ad for an insurance carrier for collector cars, where a crunched up (rear quarter panel) one if these was featured, and it served to remind me that these were steel-bodied cars. I don’t think I’ve ever seen a rusty Thunderbird of this era, though I was born about twenty years after they were made. Turquoise is THE color for these. And the way you processed the photo to have the ‘Bird be the only thing in color really shows it off. I was about two years old when the Thunderbird arrived, so on some level it’s always been part of my consciousness. Even as a young kid, I knew these early T-birds were special, like nothing else on the road. In my mind’s eye, I still see them on the road as I did then still in the early ’60s. Ford had achieved something like perfection in design; it’s still the car my right brain craves. Perfect pics for that car. Some of my earliest childhood memories involve my mom’s ’57 Starmist Blue T-Bird with a White Top. Sadly traded for a ’59 Convertible. The TBird seems most in it’s natural element in front of the Deco buildings, which is kind of funny when you put the timelines together. The Deco period was over and gone when the TBird came out, with the Mid Century Modern just starting. However, put the Bird in front of a MCM building, or a Googie, and it just does not harmonize. 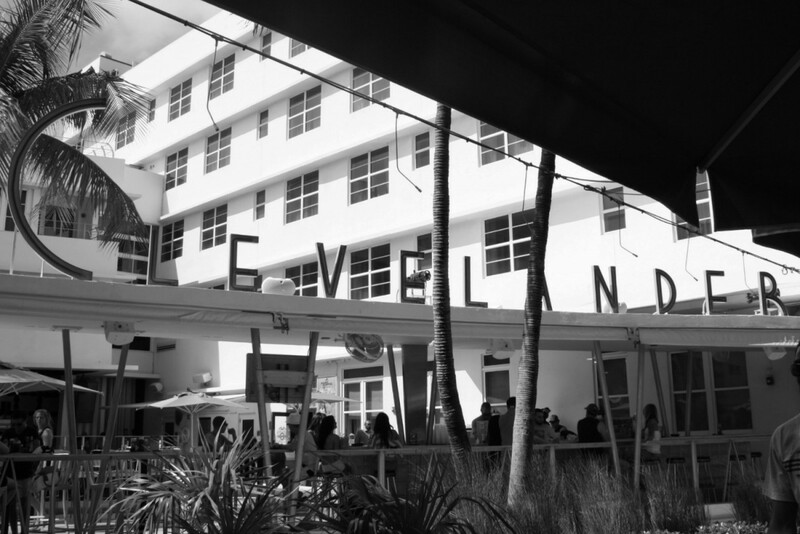 Likewise, put a Chrysler AirFlow in front of the Clevelander and it would work as well, and it WAS from that period. Perhaps that is why the TBird is so related to nostalgia, while the similar period Corvette is not. The TBird arouses the same general feeling as the Deco building, which seems to be associated more with warm and organic, while MCM is more associated with cold and inorganic. A 1961 Continental looks at home in front of a MCM building just as the TBird does in front of a Deco one. This is one of the joys of the meandering mind. You can put all these thoughts together after a quick read of an entertaining article. Thanks Joseph. And the Tampa Bay Area would welcome you back anytime! Given that it was 19 degrees F here in Chicagoland when I headed out this morning, these pictures really struck a nerve. Man, I wish I was there with that tropical Turquoise T-Bird! While ’56 is my least favorite of the 1st Generation (due to the Continental kit, though I will say it is well done from the factory), I’d still take this car in a heartbeat. Though I also like early Corvettes, this Thunderbird would be my pick, whether back then or today. In the 70s, the area known now as “South Beach” was so run down that my retired grandparents used to “winter” at the Clevelander. For $300 per MONTH, meals included. Now it’s $300 per NIGHT. That’s pretty awesome that this place still goes by the same name! I’m aware South Beach used to be a dump by the ’70s. I took a whole paragraph out of my original draft of this piece about how it took the GLBTQ community to rediscover this area and make it “nice” before it became popular again with mainstream America. I felt it sounded too tangential to my appreciation of this car – but it’s true. I was recently watched an old episode of “Miami Vice” set in South Beach, and it was jarring to see how things looked here back then. When I see this particular generation of Thunderbird, I can’t help but think of the one that was in Cheech & Chong’s Next Movie…you know, the one that they stole gas for and eventually blew up. What great ads! The milkman admiring mr. old money as he heads for the city, the old boy thinking “hell, yes! I’m lookin good!”. I agree with your friend Shauna, Joe. You gotta be you. All the regular contributors here at CC put their own spin on the stories and pictures they submit to make it an enjoyable read and I was trying to think how to describe my feelings toward your contributions. 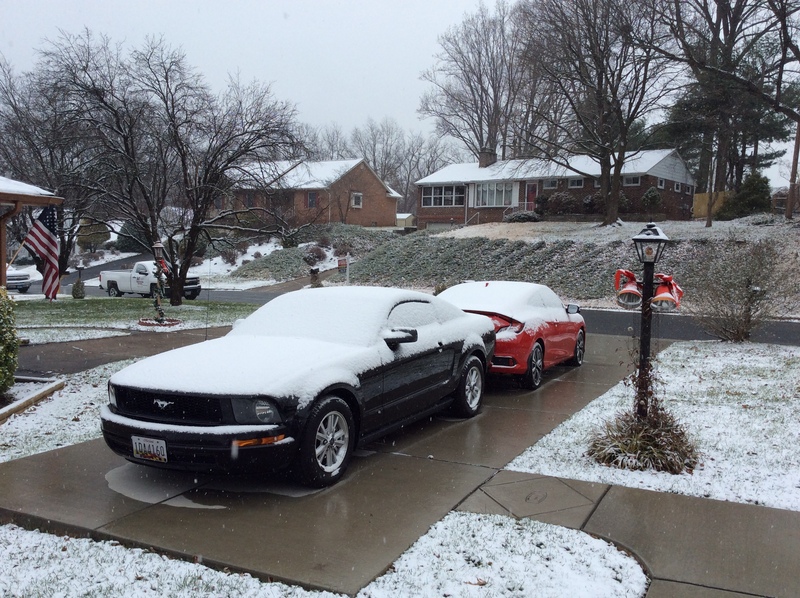 Joe….you make these cars breath! Bill thank you so much! I also really admire the writing of my fellow contributors. Believe me – if this site was not great, I wouldn’t be here or care. :). I like that you perceive that I give “life” to the cars I write about. Thanks, everyone! I’m late with reading comments and providing feedback after an afternoon of holiday parties. But I really appreciate the kind words. 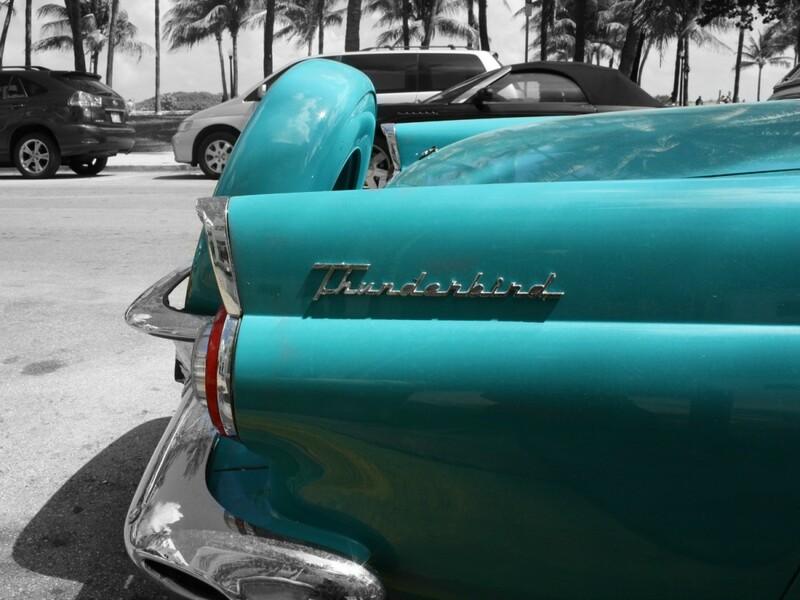 As snow just fell in Chicago last night (the second substantial snowfall of the season, with the first occurring when I was in Italy last month), I super-wish I was in this Thunderbird in Miami right now! Hope this old girl is still on the road – it’s beautifully restored. BTW, I’m a little curious about the ad – do men wear mink coats, really? Saturday December 16th a bit before 5:30, Mrs JPC and I were out driving. What passed us the opposite direction but a salmon pink 56 Thunderbird convertible with its top down. I’m not sure what but the CC Effect could explain this on a sunny but chilly December day in Indiana. The CC Effect is real. Folks had better recognize.